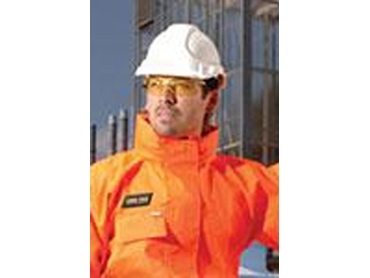 Safety gear specialist Elliotts presents chemical splash suits designed to protect workers against accidental splashes of chemicals in various industrial environments. There is a huge increase in the use of caustic liquids and chemical solvents in manufacturing and maintenance processes in diverse industries including mining, oil and gas, petrochemical, metallurgy and heavy manufacturing. Processes such as chemical separations, alkylation, electropolishing, anodising, phosphating and caustic cleaning through to fuel management, all require the handling of potentially dangerous chemicals that can cause life-threatening burns from splashes. Typical chemical splash danger areas in various industrial environments include operations, inspections, stock management and maintenance in petrochemical industries, solvent extraction, leaching, refining and flotation in mining, oil and gas, plant operations, manufacturing and maintenance in heavy manufacturing, and electropolishing, aqueous cleaning, pickling, anodising and phosphating in metallurgy. Chemical splash and Hazmat apparel are increasingly being developed to withstand splash and gaseous dangers during the handling of chemical materials, and protect operational teams responsible for handling these chemicals onsite. Chemical splash suits made by Chemtech have been tested to provide high protection against chemical splash to the following standards: AS4602.1999, EN471:2008, EN1149-1:1995, AS2755.1-1985, AS/NZS ISO 6530-2006, AS3765.1:1990 and GB12012-1989. Chemtech fabrics have also been tested against liquid chemicals including hydrochloric acid 37%, sodium hydroxide 40%, jet fuel A1 100%, sulphuric acid 98% toluene, and tetrachloroethylene and nitric acid 50%. Elliotts is an Australian based designer, manufacturer and distributor of world-class quality safety gear servicing the Australasian market.